This portal is manually maintained by Mhhossein. Please contact these user(s) when you plan to make significant changes. Two leaves of an early Quranic manuscript in the Mingana Collection of Middle Eastern manuscripts of the University of Birmingham's Cadbury Research Library were discovered in 2015 as being dated between 568 and 645, making it one of the oldest Quran manuscripts to have survived. The rest place and mausoleum of Husayn ibn Ali, the third Imam of Shia, in the city of Karbala, Iraq. Imam Husayn, who was a grandson of Muhammad, was buried near the place where he was martyred during the Battle of Karbala in 680 C.E. Fatimah bint Muhammad (/ˈfætəmə, ˈfɑːtiːˌmɑː/; Arabic: فاطمة‎ Fāṭimah; born 615 AD, 5 BH – died 28 August 632 [disputed]) was the youngest daughter and, according to Shia Muslims, the only child of the Islamic prophet Muhammad and Khadijah who lived to adulthood, and therefore part of Muhammad's household. Her husband was Ali, the last of the Rightly Guided Caliphs, and her children include Hasan and Husayn, the second and third Shia Imams, respectively. 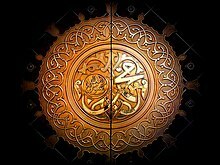 She is the object of love and respect of Muslims, as she was the child closest to her father and supported him in his difficulties, was the supporter and loving caretaker of her own husband and children, and was the only child of Muhammad to have male children live beyond childhood, whose descendants are spread throughout the Islamic world and are known as Sayyids. Al-Risalah al-Dhahabiah (Arabic: الرسالة الذهبیة‎, Arabic pronunciation: ['rɪsælætæ 'ðæhæ'biæ]; "The Golden Treatise") is a medical dissertation on health and remedies attributed to Ali ibn Musa al-Ridha (765–818), the eighth Imam of Shia. He wrote this dissertation in accordance with the demand of Ma'mun, the caliph of the time. It is revered as the most precious Islamic literature in the science of medicine, and was entitled "the golden treatise" as Ma'mun had ordered it written in gold ink. The chain of narrators is said to reach Muhammad ibn Jumhoor or al-Hassan ibn Muhammad al-Nawfali who is described as "highly esteemed and trustworthy" by al-Najjashi. The Sahifah of al-Ridha (Arabic: الصحیفة الرضا‎, al-Sahīfa al-Riḍā, lit. "The Pages of al-Ridha"), also known as the Sahifat of al-Reza (Persian: صحیفهٔ امام رضا‎: Ṣaḥīfe ye Imam Reżā) and the Musnad al-Imam al-Ridha ("The Book of Imam al-Ridha"), is a collection of 240 hadiths attributed to Ali ibn Musa al-Ridha, the eighth Shiite Imam. Ali became the caliph after the assassination of Uthman in 656. However he faced opposition from some factions including the Levant governor, Muawiyah I. A civil war, called the First Fitna, took place within the early Islamic state which resulted in the overthrow of the Rashidun caliphs and the establishment of the Umayyad dynasty. It began when the caliph Uthman ibn Affan was assassinated in 656 and continued through the four-year reign of Ali. Seyyed Morteza Avini (Persian: سید مرتضی آوینی‎; also spelled Aviny; 23 September 1947 – 9 April 1993) was an Iranian documentary filmmaker, author, and theoretician of "Islamic Cinema." He studied Architecture at Tehran University in 1965. Nimr Baqir al-Nimr (Arabic: نمر باقر النمر‎, translit. Nimr Bāqir an-Nimr; 21 June 1959 – 2 January 2016; also Romanized Bakir al-Nimr, al-Nemr, al-Namr, al-Nimer, al-Nemer, al-Namer), commonly referred to as Sheikh Nimr, was a Shia Sheikh in al-Awamiyah in Saudi Arabia's Eastern Province whose arbitrary arrest and execution was widely condemned, including by governments and human rights organizations. Sheikh Abdul Amir al-Jamri (/ˈɑːbdəl əˈmɪər æl ˈdʒɑːmri/ ( listen) AHB-dəl ə-MEER al JAHM-ree; Arabic: شيخ عبدالأمير الجمري‎; 1 March 1938 – 18 December 2006) was one of the most prominent Shia clerics and opposition leaders in Bahrain. He was also a writer and a poet. Mohammad Kazem Khorasani or Akhund-e Khorasani (Persian: محمد کاظم خراسانی‎, (1839-1911)) was Twelver Shi'a Marja, politician, philosopher, reformer. He's regarded as one of the most important Shia Mujtahid at the time. He was a lecturer at Najaf seminary for years and significant number of students from "different regions of the Muslim world" used to participate his lectures. His most famous work is The Sufficiency (Arabic: کفایه‎) where he gathered the jurispurdential ideas such as `continuity` and "presented them in a yet more rigorous fashion as a unified theory of jurisprudence." Musa al-Sadr (Arabic: الامام موسى الصدر‎‎; Persian: سید موسى صدر‎‎; 4 June 1928 – disappeared in Libya on 31 August 1978) is a Lebanese-Iranian philosopher and Shi'a religious leader from a long line of distinguished clerics tracing their ancestry back to Jabal Amel. Abu 'Abd Allah Muhammad ibn Muhammad ibn al-Nu'man al-'Ukbari al-Baghdadi, known as al-Shaykh al-Mufid (Persian: شیخ مفید) and Ibn al-Mu'allim (c. 948–1022 CE), was a prominent Twelver Shia theologian. His father was a teacher (mu'allim), hence the name Ibn al-Mu'allim. The title "al-Mufid" was given to him either by Muhammad al-Mahdi, the twelfth Shia Imam, or by al-Rummani, a Sunni scholar, after a conversation with him. The leader of the Shia community, he was a Mutikallim, theologian, and Shia jurist. "If people realize the value of science and knowledge, they will sacrifice themselves for earning it." Majlisi, Bihārul Anwār, vol.1, p. 183..
1 - Nov:Islamic Movement in Nigeria (IMN) reports forty-nine deaths since 27 Oct-2018 and refutes Nigerian Army’s official death toll of six. The USA Embassy in Nigeria asked for an inquiry of clashes between IMN supports and Nigerian Army . Amnesty International claims use of automatic weapons by the police and security forces during IMN Arba’een marches in and around Abuja in which 45 people were killed and some 122 injured  & . According to camera recording of 10 by-passes, this year 11.9 million pilgrims entered the city of Karbala after 10th of Safar (20 October-2018). These statistics do not cover the people who arrived the city of Karbala through main streets and those remained out of city. Estimation of people entered prior to 20th or in the afternoon of Arbaeen day have not been counted. 27 - Oct:Killing of Five members of the Islamic Movement in Nigeria (IMN) is reported . Spokesman of the IMN discloses that members of their community from Suleja city were attending a three days peaceful religious procession of Arbaeen from 27 to 30 October-2018. 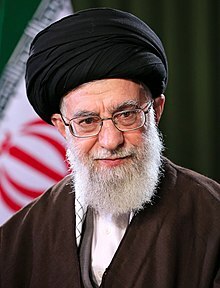 ...that Ruhollah Khomeini, in his letter to Gorbachev, invited him to monotheism and Islam also predicted the dissolution of the Soviet Bloc?" ...that Al-Istibsar is one of the four major works of Shiite Islamic traditions authored by Shaykh Tusi, a Shia scholar? ...that Shia Muslims believe a future ruler of Yemen, named al-Yamani, will appear as one of the signs of the reappearance of Muhammad al-Mahdi? This page was last edited on 20 April 2019, at 04:31 (UTC).